The new EU General Data Protection Regulation (GDPR) provides a single, harmonized data privacy law for the European Union. With the increasing risk of data breaches from cyber attack, the GDPR aims to prevent the loss of personal data by improving data security for all individuals living in EU member states. UK organizations have until May 2018 to comply with the new law, or potentially face fines of up to 4% of annual turnover or €20 million. Under the GDPR, the appointment of a data protection officer (DPO) will be mandatory for controllers and processors in the public sector, and for those with ‘big data’ processing activities. The DPO position will be a challenging role to fulfil, given the breadth of knowledge required to manage IT systems, and the requisite familiarity with the legal aspects of the GDPR. The four-day Certified EU General Data Protection Regulation (GDPR) Practitioner classroom course is focused on enabling delegates to fulfil the role of data protection officer (DPO) under the GDPR, and covers the regulation in depth, including implementation requirements, the necessary policies and processes, as well as important elements of effective data security management. Delivered by an experienced data protection consultant, the course is built on the foundations of our extensive practical experience gained advising on implementing compliance with data privacy laws and related information security standards such as ISO 27001. 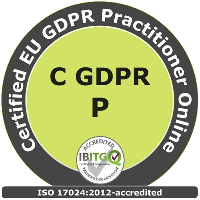 The course also supports professional development: students who pass the included exam are awarded the ISO 17024-accredited EU GDPR Practitioner (EU GDPR P) qualification by IBITGQ. Click here for full course description or to register.